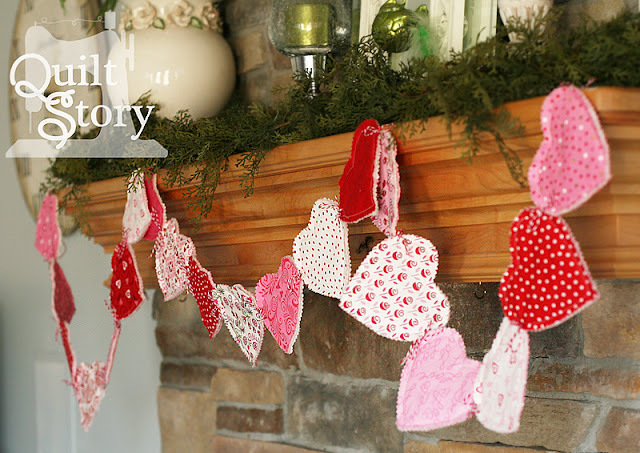 Quilt Story: Simply Charmed Blog Hop Valentines Tour! Welcome to Quilt Story's stop on the Simply Charmed blog hop tour! We are going to make a Valentine's garland! Easy and cute! 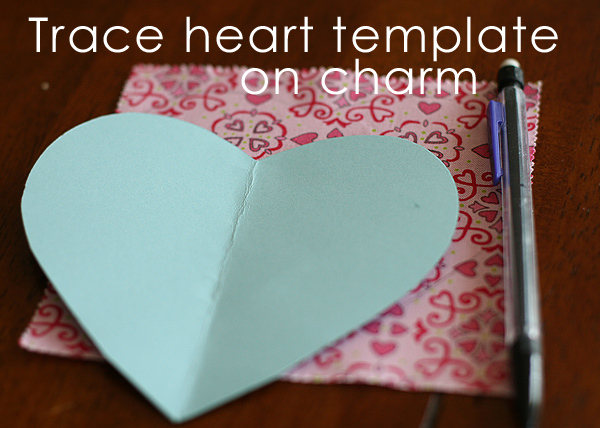 Trace on only half the charms you plan to use.. using this heart template. Pair a traced heart with a non-traced heart, right sides out and batting in-between. Cut on the line with pinking sheers. Use a large enough needle for the twine. This was a bit of a pain, but I found if you seperated each layer as you poked the needle through, it was much easier. Tie the twine into a knot, then a bow. Hang it anywhere and it looks cute! 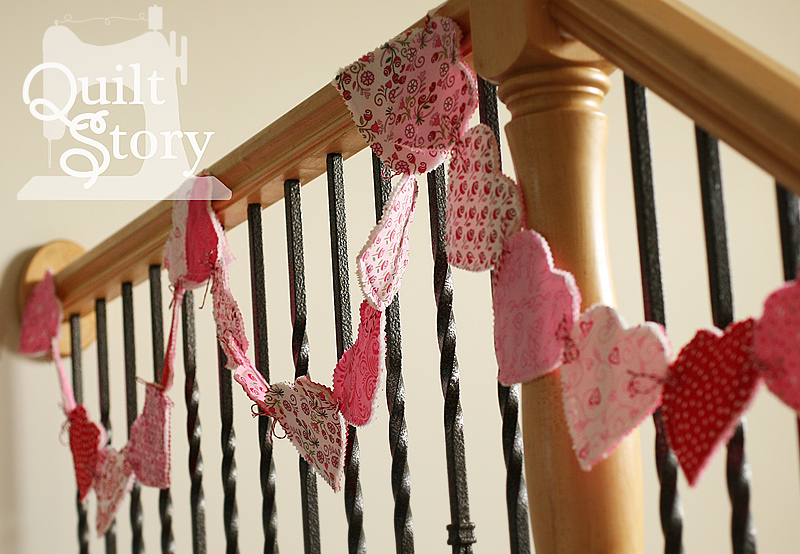 Hmmm...heart garland for the whole staircase...next year??? Burgundy Buttons is giving away a $25 gift certificate on QUILTSTORY! 1) Leave a Valentines comment, memory, gift etc. Be sure to follow the tour, as there are great prizes at every stop! Melissa from HAPPY QUILTING, Fat quarter shop is giving away $200. Thank you Melissa for the fun tour and for organizing it all! This is a great tutorial! Usually I don't get much into Valentine's Day, but as a kid it was so much fun to make your own cards and look forward to giving them out. 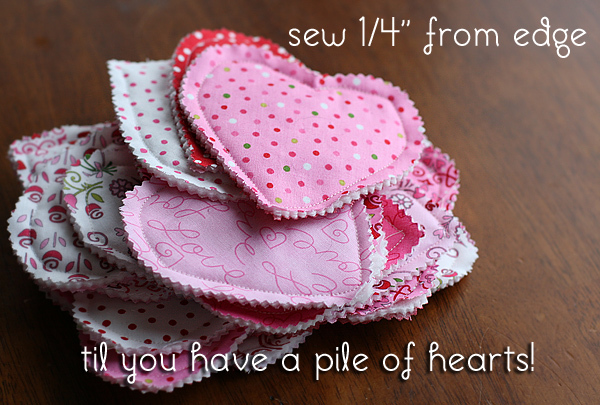 :) This year I might actually make an old-fashioned paper valentine for my husband (or a felt heart valentine!). My husband had flowers sent to my work place. It was so sweet. I don't have a valentines tradition. We will go out and have a nice evening I think. Best Valentine's gift= Godiva chocolates. Yum! The last year my hubby organized a trip to Amsterdam ... so sweet and a wonderful surprise !!!! Not so big on Valentine's Day because it coincides with my birthday, but flowers are always nice! And I follow Quilt Story !! I struggle with questions on Valentine's Day. It's really not a big deal at all in the UK and we only give cards and presents to our other half, not the whole family and friends. I'm the same as Wendy, though my DH can be a bit of a romantic at times and is given to the odd surprise, like a single red rose sent to my office, the odd card and sometimes even supper! My husband sends me flowers every year to my office for Valentine's Day. I think Chocolate Dipped Strawberries are a wonderful little gift for Valentine's Day. Where I live it's hard to get nice strawberries this time of year, so that makes them a special treat. I follow your blog. Love the inspiration you provide! I love getting flowers. Although a card is just as nice. I'm a Quilt Story follower. Thanks for the chance to win & the garland tutorial. Back in grade school, we made Valentine's Day mail boxes (decorated boxes with a slit in the top) and small valentine cards from colored paper & lots of glitter. Fond memory. Thanks for the chance to win. When I was little, my sister and I would wake up every Valentine's Day and find Valentines from our dad. Mom found one, too, and hers was always the nicest. We don't really celebrate valentines day in our area or as family. So it is the firts time I am doing a miniquilt for my husband to hang next to his computer with a bird and letters saying I lovel you. Fun Project. I love this garland. Iam already a happy follower. 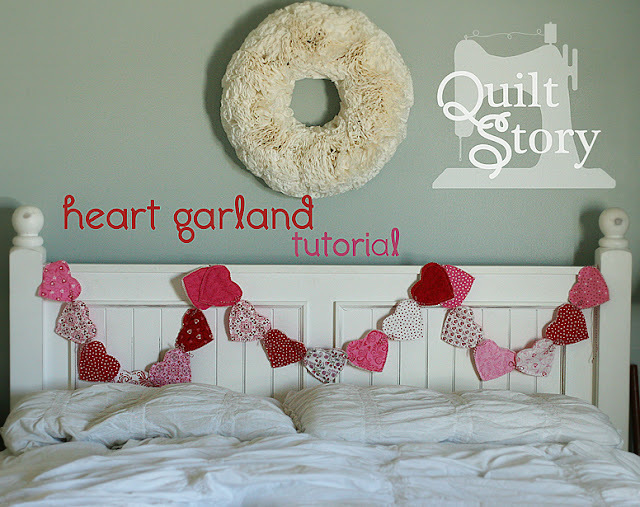 what a great garland and tutorial! Thank you for sharing it! I'm not a big Valentine's fan. I don't like the price inflation on flowers that only last a week or so. I'd rather have something for my garden that will last, of course it is the wrong time of the year for that though! That's what I prefer for Mother's Day and anniversaries. I do have to say I love decorating for the holiday though. All the hearts are just so pretty. Cute project! I love to make Valentine cookies - soft rollout sugar cookies with icing and lots of sprinkles. Add a stick and you have a fun treat. Flowers and chocolate are really special for me!! My favorite Valentine's Day memory was actually while my husband was working over in Africa. I was feeling kind of depressed, but he called and told me to check behind the books on the bookshelf. It turns out when he was home the month before he had gotten me a gift and hidden it. It was just a stuffed Valentine's Day themed alien (lol), but the pre-planning and thought meant a lot to me especially since he's usually not much of a V-Day kinda guy. Cute garland! I'm definitely doing it. For Valentine's Day, my sweetie sends me beautiful flower arrangements at work - every year! All day I sit at work anxiously waiting for my flowers! I love it! LOL - years ago my DH decided I needed a cell phone so he gave me one for Valentine's Day! Oh so romantic, huh?! Best Valentines ever is being able to go to Florida tomorrow for 11 days to be with the love of my life. I am a follower. Love that cute tutorial. Thanks. Last year my four year old made me a Valentine's Day card. It was the best Valentine's Day ever. Great garland--thanks for sharing! I am a follower! I'm a follower! Cute tutorial!! I usually get roses for V-day. One year my dh got me a mini rose plant and come warmer weather (we are in New England) I planted it outside--it is still growing and blooms every year! The garland is so cute, I think my nieces would enjoy just playing with the pile of hearts tho! Thanks for the giveaway chance! One year I had just broken up with a boyfriend and was still pretty torn. My parents made me dinner and bought me the cutest beaded bracelet. It meant so much that they cared! My godson was born on Valentines Day so always a special day for us! I like to surprise my coworkers with a little something - I am making heart sugar cookies this year. thanks - love the heart bunting! Right around Valentine's Day I usually send letters and fun notes to lots of friends in my address book. It's a good way of keeping in touch and responding to any notes I've received in their Christmas cards earlier. I already subscribe to Quilt Story. My fave memory is when my husband got me a bright red frying pan for Vday. He wrapped it in a HUGE heart shaped box. Favorite memory is when I received a Vermont Teddy bear in the mail for valentines day from my husband! Last year I got my first Valentine from my son that he made at playgroup. So adorable and it's hanging in my kitchen even now! Roses are Red, Violets are Blue, Your Garland is Sweet and so are You! My mom decorated the night before Valentines Day so that when we came into the kitchen for breakfast our table was full of candy and cards and pretty decorations. It was wonderful. I did it for my kiddies too. adorable! I am a follower. as a kid, I loved giving and receiving Valentine's from my classmates. I received a tire for my car for Valentine's Day many years ago. He said taking care of my safety was a very loving gesture. I am a follower of Quit Story. What a cute Valintines Day decoration! Love it! My favorite memory is of our "sweetheart angle" bringing my brother and I little gifts for Valintines Day. I love this!! And I'm totally doing it! :) Happy Valentines Day!! We traded those little heart candies with each other. It was so much fun to find just the right one to give. Trick was to eat all those that didn't fit before someone gave it to you! Many moons ago, gave me a box that contained a purple fishing hat with a pair of purple earrings hanging from it, and a note talking about us being together even until the years when I would wear purple and red (he didn't know it was red hat, but that doesn't matter). Isn't that romantic?!?!? Chocolates! Gorgeous chocolates would have to be up there as one of the best Valentines specials. As a child I LOVED Valentine's Day. I remember spending long afternoons making homemade Valentines for every kid in my class using paper doilies shaped like hearts. Now that I have a daughter of my own (who is about to turn 1! ), I am looking forward to when she is old enough for me to revive the card making and Valentine's Day excitement. I am a follower of quilt story. Thank you for the tutorial and the giveaway! I'm already a follower ... & love reading your blog :) thanks. I love this garland ... my daughter is studying abroad in Spain & I'm gonna try & whip one up this weekend to send her! thanks for the idea. My favorite Valentine's gift was a diamond bracelet from my husband! What a cute tute...much better than my hearts of red/pink magazine pictures on garland! : ) I always have my kids make their cards for their friends and we have such a great time doing that. Thanks for the giveaway! I am a follower , love the inspiration you provide! I'm on my way to my stash now, that garland is the cutest! I'm a follower, Thank You. I was pregnant on our first Valentines as a married couple and I was horribly sick with Influenza B and bronchitis. I to wear a face mask when my husband was home to keep from spreading it to him. No kissing aloud. We spent a lot of time hanging out and he took really great care of me but it's not a Valentines I'd like to repeat. I'm a follower and I LOVE the garland! It looks so fast and easy! I am a follower. Cute garland. That is the cutest garland. I don't have much in the way of a valentine story. My mother would do lovely things for most holidays including Valentine's. My favorite valentines my wife bought me some flowers. I am a follower and the Garland is wonderful. My birthday is on Valentine's day...so when I was little...I thought all the fuss was for me...Cute garland. Thanks for the great giveaway. I'm a follower - Love that garland! How cute! I'm off to search for some fabric now. My favorite valentine memories are the handmade cards my children made for me. I save every single thing they made. Growing up, my mom always made us pink, heart-shaped pancakes for breakfast on Valentine's day. Oh I love this idea! Thanks! For Valentines, I usually give chocolates and a small gift to my 3 daughters. I'm a follower of Quilt Story! I am a follower of Quilt Story! It is all about chocolate here in this house, The more the better. I always liked the Valentine Day parties that we had in grade school. Valentines is all about the date. The garland is soo cute! I don't have any strong memories of Valentine's gifts-I used to buy stuff for my kids when they were little, but we didn't make a big deal of this holiday. I think the most memorable Valentine's gift I have ever given was to my daughter. She was 13 at the time, and had been having some troubles with being teased at school. I ordered her a small bouquet of flowers, a teddy bear, and a small box of candy and had them delivered to her at school in front of everyone. She became the "cool" girl for a little while and the teasing stopped. 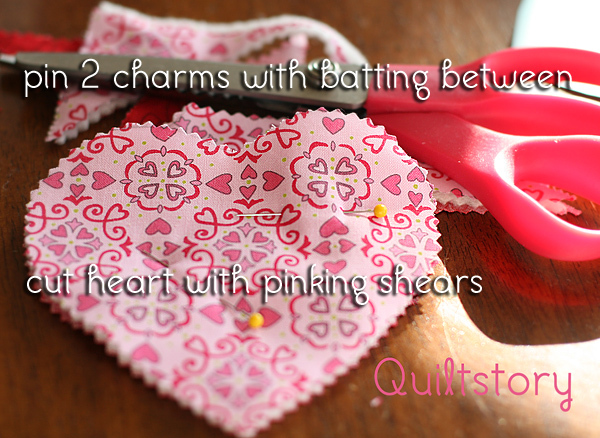 Cute and easy, Love the pinking around the hearts. I am a follower. I love this idea! I bought a sparkly LOVE bunting type thing years ago and hung it on our tall mirror in our bedroom.. My SO loved it so much, we've never taken it down :) It's a little bit of Valentine's Day year round. My husband proposed to me on Valentine's Day. I used to get way into making chocolates for Valentines. One year, way before you could purchase them, I made my husband a 1/2 lb bar of chocolate. I found a mold and everything. His favorite candy bar is a plain Hersheys bar. I also used to make suckers and I'd make heart shaped ones in all shades of red, pink and white. One year my teen gave me a paper she'd color penciled and framed. It says "Mothers hold their childrens hands for awhile, their hearts forever." I've hung it in my bathroom ever since. She apologized for not getting me roses! I treasure everything about it. Thanks for letting me remember. I love the valentines garland. Such a cute way to decorate! One of my favorite Valentines memories is as a child, when my mom would make us heart pancakes and have special little gifts for us. Oh and I am already a follower of your blog. I love it! My mom still gives me (and now my kids, too!) Valentines socks. The bright hearts can't help but make us all smile! I'm a follower! When my sons where young I would make a fancy dinner for Valentines, set the table w/good dishes and serve them, make it fun and special for the whole family! Fun memories. We don't really do Valentine's Day. With a little one maybe we'll start some traditions. Cute tutorial! I'm a follower of Quilt Story. Ah Valentines Day. My best memories are of the little valentines we gave out in grammer school where we carefully selected the perfect little heart candy with the right message (be mine, best friends)to include in the little envelope. Simple joys. No valentines traditions. We typically try to go out a day before or after so we don't have to deal with waits, etc. I guess we are boring, but it doesn't bother us. Sometimes hubby surprises me with flowers which is always a nice treat. Last year, I had an awesome time making Valentine's Day cards with a friend! Awesome tutorial! Love the garland. My fav Valentine is one that I found several years ago. It was sent to my grandmother, from my grandfather while he was overseas during WW2. It is a very romantic pop-up with crepe paper heart attachments. Cute heart garland! I'm your follower. I am already a follower. Love your blog! Love the garland.I enjoy making Valentines Day cupcakes. The garland is so cute and easy! Thanks for participating in the blog hop! I'm a follower! Valentine's memory, huh? I was proposed to on V-day, even though we were already engaged. THen 2 days later we got pregnant BAHAHAHA! Hi there, great tutorial, thanks! My favorite Valentine's tradition is leaving candy for my kids to find that morning. I hide one box for each of them while they're sleeping. The kids are 12, 19 & 20 now and when they're home they still look for them! My favorite valentine was when my 3 children saved their money and bought me a big heart shaped box of chocolates. They were so excited to give it to me and once it was opened they ate every piece of candy. I am a follower. Thank you for a great giveaway. I don't celebrate valentines day really, so I don't have any stories. I like to make little crafty gifts everyday for those I love and I know exactly who I want to make this for! an awesome gift idea: Write 100 (or more or less) reasons why you love someone on little strips of paper. Tape them to the tags on chocolate Kisses and put them in a pretty bag. My favorit thing about valinties day is the kissing. I am now a follower. Thanks for the lovely tut I am going to do this one! I always receive a susprise gift from my husband. Last year he gave me a beautiful silver bead to put on my Pandora bracelet. I'm a new follower. Thanks for the tutorial, it's really cute. My g-babies made me a valentine last year which I still have. I hope I get another one this year!! 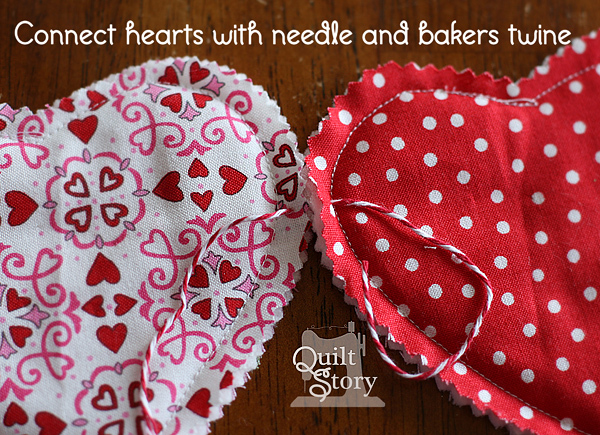 Great idea, I bet you could even quilt the hearts out of Valentine's Day fabric scraps! Thanks for the giveaway! Oh my favorite would just be dinner out. :) Love spending time with hubby. I love Valentine's Day - no cooking for me. The night before - we have everyone write "love notes" to every other person in the family on construction paper hearts. (we have six kiddos....) Then - after they all go to bed, my hubbie and I hang garlands on each of their doors w/ the love notes that tell what everyone else appreciates about them. They love it! My favorite Valentine was when my 5 years old daughter gave me a card she made. my husband was the best at picking out cards I just could not compete, so we agreed that I would bake for him and he would continue with the lovely cards - will miss that this year. This is beautiful, I always want to decorate for valentines, but just keep putting it off, I think this project would be a great stepping off point. My favorite valentine's day was the one but a few years ago when my sweetie moved from CA after almost 2 years of doing the long distance thing. It was our first actual valentine's day in the same city! Super cute idea. I really need to get some of that bakers twine. I just love all the colors that can be ordered in. I've followed your blog for quite awhile but for some reason, never clicked on the 'follow' button. I am now following on GFC. This would be perfect to decorate the rooms at the Children's Hospital in Spokane WA. Have to get to work on it! Love this cute idea. Would be great to do with my grandson.